Kiki's production blog is the funniest, and I still can't stop laughing! 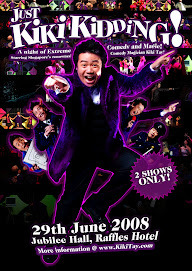 A brillant leadup to his show on 29th June 2008, you will definitely want to meet the man, Kiki Tay, after reading this! Check it out now...he's on his "read or I'll shoot" mode right now. Zephyhdom is a proud sponsor, and we are waiting to watch his dream come true! Support his dream, support a happy, fast-paced comedy show by heading over to the friendly people of Gatecrash!